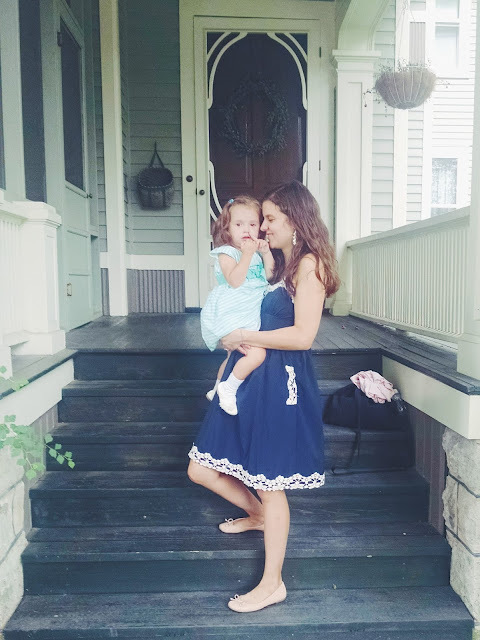 The link between the monastic vocation and the vocation of motherhood is the basis for this blog. I've shared my thoughts on this before, but something I read the other day made me think about it more deeply. Amelia's sister (who is a Sister) was home visiting her family recently, and answered a a slew of questions. One quote in particular really stood out to me, "The purpose of contemplative orders is to dedicate our lives to praising God and interceding for the world. Jesus said, "The poor you will always have with you, but you will not always have me " to Mary who "wasted" the perfumed oil on Jesus rather than selling it to feed the poor. That is kind of like our lives. 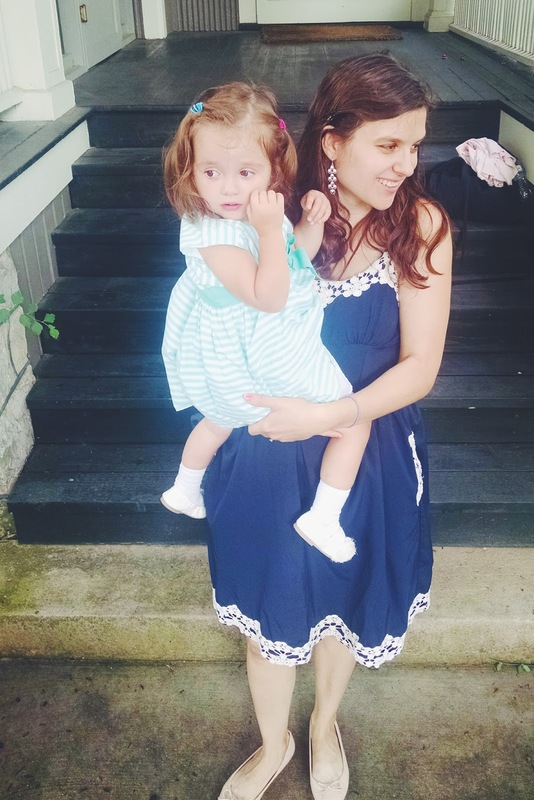 We "waste" our talents and energies on praising God ..."
I have a bachelor's and a master's degree from a prestigious university, and when people realize that I am "staying home" to raise my girls, they sometimes wonder why. When Therese was a baby, I worked full time at a parish (while simultaneously watching her and finishing up my master's degree, which was absolutely crazy). After experiencing that way of life, I realized that I wasn't called to it. A lot of women who I deeply respect have felt called to continue to work full time while their children were small, but I just wasn't one of them. 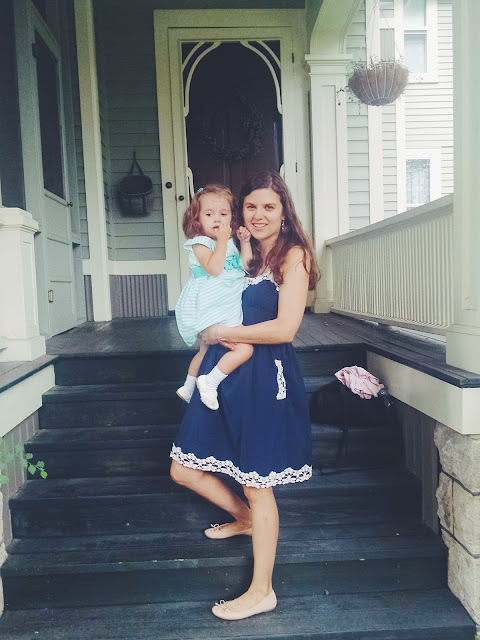 It was a huge identity shift - to go from working and grad school to being home with a baby. I'll never forget the first day that Andrew started his doctoral "work," leaving Therese and me behind. I looked up a DIY fingerpaint recipe, set her up with a smock and her high chair, and had her make me some lovely masterpieces for my kitchen cabinets. Andrew later confessed that he got home that day, saw the paintings and started to worry that - in my enthusiasm - the kitchen surfaces would rapidly be covered with baby artwork. But I had to find my balance, as all mothers do. Now, four years later, I've begun to find what works for me. I've found ways to continue to contribute to the world of theology and ministry. I'm pretty happy with the balance I've found, at least for the time being. But every now and then, I have a conversation with someone, and they mention to me a job opening that they think I'd be a good fit for. And then, it always gives me momentary pause. Am I doing the right thing? 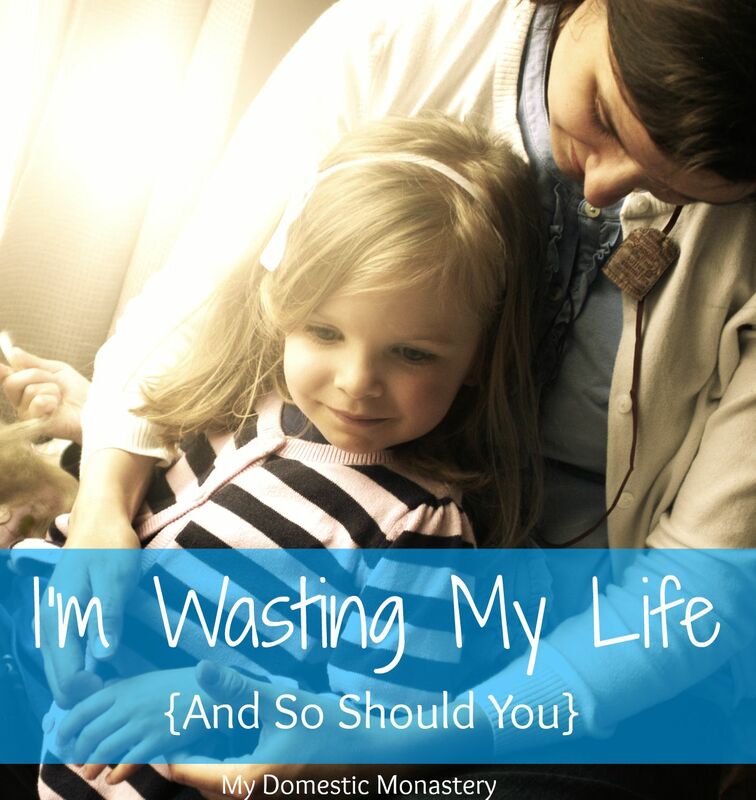 Am I "wasting" my talents on my children. Well, yes. In a way. And that isn't a bad thing in the slightest. There are two ways to look at the concept of "wasting." On the one hand, we all the moral implications that go with that word. "You're being wasteful." "Don't waste food." "You're wasting time." But on the other hand, we have the above example of the woman anointing the feet of Christ - lavish use of something, purely out of love. In this sense, being wasteful confounds the world's sensibilities. There is no equality in love. In love, there is only lavishness - eagerness to sacrifice for the sake of the other, without expecting anything in return. This is wasteful, in the eyes of the world. Could I be using my gifts to be bringing in a salary? Yes. But is that what I'm being called to do at this time in my life? No. God is calling me to be lavish in a different way. This concept, the idea of "wasting" your life for love of God and others, doesn't just apply to mothers, though. It applies to everyone. Anytime we confound the bottom line mentality of our society, we're being "wasteful." If we do this for the love of God and others, than we are being wasteful in the right sense. Do you have something of value that you'd like to sell? Why not donate it instead, for love of those who go without. Are you in a rush to get into the bank or post office, but you see an elderly lady approaching the door behind you? Take the extra minute to hold the door open for her. In a hurry to get out of church after Mass, and see a particularly chatty fellow parishioner approaching you? Lovingly wait for them and spend a few minutes listening. All of these actions - and any actions in this spirit - are wasteful. They don't make us gain time or money. They don't help us to advance in this world. And all of them can be done simply for the sake of love. Love is wasteful. Love is lavish. Waste your life for love of Christ. Linking up with Fine Linen and Purple. This was a beautiful piece. I remember Fr. John Ricardo said go "waste" time with Jesus. Thinking of time spent with friends is not anything but wasting time. What greater treasure to waste your love and time on than your children! Love your dress and your photos with your girl. This is beautiful. 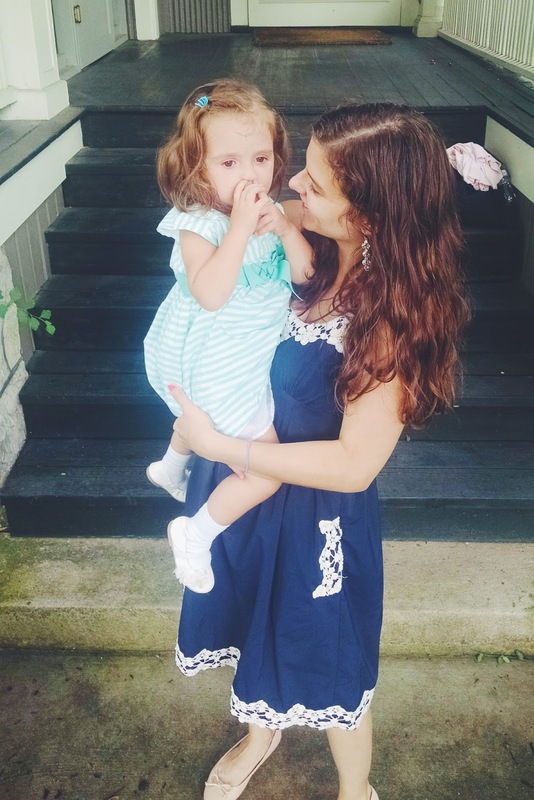 Thank you so much for sharing this reflection and for linking up with us! Yes to all of this! I'm (technically) a registered nurse but am not working anymore. It's so hard for some people to grasp, especially when I could easily be the breadwinner in our home...but I know God was calling me to stay home with my boys. I think everyone has to face these questions at some time or another. One of the gifts of vocation is that we are called to reflect on these things early and often, throughout our lives, through the tiny details of that state of life. Both motherhood and the religious life "force" us (lovingly) to grow into the kind of selfless holiness Jesus intends for us, if we are open to being refined. Thank you for this meditation.